For other uses, see Slump (disambiguation). A slump is a form of mass wasting that occurs when a coherent mass of loosely consolidated materials or rock layers moves a short distance down a slope. Movement is characterized by sliding along a concave-upward or planar surface. Causes of slumping include earthquake shocks, thorough wetting, freezing and thawing, undercutting, and loading of a slope. Translational slumps occur when a detached landmass moves along a planar surface. Common planar surfaces of failure include joints or bedding planes, especially where a permeable layer overrides an impermeable surface. Block slumps are a type of translational slump in which one or more related block units move downslope as a relatively coherent mass. Rotational slumps occur when a slump block, composed of sediment or rock, slides along a concave-upward slip surface with rotation about an axis parallel to the slope. Rotational movement causes the original surface of the block to become less steep, and the top of the slump is rotated backward. This results in internal deformation of the moving mass consisting chiefly of overturned folds called sheath folds. Slumps have several characteristic features. 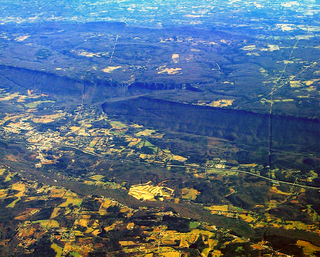 The cut which forms as the landmass breaks away from the slope is called the scarp and is often cliff-like and concave. In rotational slumps, the main slump block often breaks into a series of secondary slumps and associated scarps to form stairstep pattern of displaced blocks. The upper surface of the blocks are rotated backwards, forming depressions which may accumulate water to create ponds or swampy areas. The surface of the detached mass often remains relatively undisturbed, especially at the top. However, hummocky ridges may form near the toe of the slump. Addition of water and loss of sediment cohesion at the toe may transform slumping material into an earthflow. Transverse cracks at the head scarp drain water, possibly killing vegetation. Transverse ridges, transverse cracks and radial cracks form in displaced material on the foot of the slump. An earthflow is a downslope viscous flow of fine-grained materials that have been saturated with water and moves under the pull of gravity. 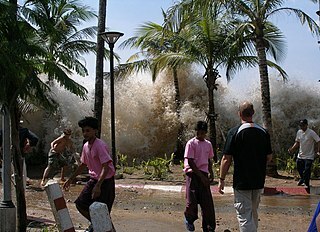 It is an intermediate type of mass wasting that is between downhill creep and mudflow. The types of materials that are susceptible to earthflows are clay, fine sand and silt, and fine-grained pyroclastic material. The Swift Creek Landslide is an active, slow moving landslide located in western Washington, USA, due east of Everson on Sumas Mountain. Asbestos laden sediment originating from the landslide has recently generated much interest in this area. Asbestos is a known carcinogen. EPA sampling has documented asbestos in sediments in Swift Creek and in downstream Sumas River. Average asbestos levels in Swift Creek dredged material exceed the level that, in construction materials, triggers worker safety requirements and material handling and disposal regulations. 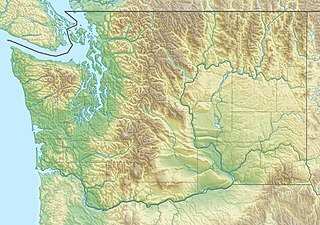 Sumas Mountain is a mountain located in Whatcom County, Washington, 15 miles northeast of Bellingham and southwest of Vedder Mountain. Located in the Skagit Range the mountain is notable for its high biodiversity and year-round hiking trails. It is sometimes referred to as American Sumas to distinguish it from an identically named mountain just to the north in British Columbia. It is largely owned by the Washington Department of Natural Resources, but some parcels are privately held. While the public land is open for recreation, it is managed primarily for timber harvest. Clearcuts are present on many slopes and most all the remaining forest is in varying stages of recovery and regrowth. A fault scarp is a small step or offset on the ground surface where one side of a fault has moved vertically with respect to the other. It is the topographic expression of faulting attributed to the displacement of the land surface by movement along faults. They are exhibited either by differential movement and subsequent erosion along an old inactive geologic fault, or by a movement on a recent active fault. 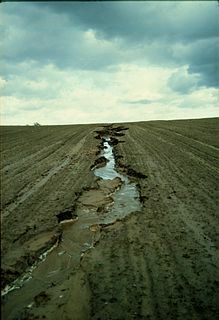 There have been known various classifications of landslides and other types of mass wasting. 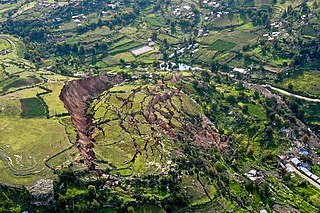 The causes of landslides are usually related to instabilities in slopes. It is usually possible to identify one or more landslide causes and one landslide trigger. The difference between these two concepts is subtle but important. The landslide causes are the reasons that a landslide occurred in that location and at that time. Landslide causes are listed in the following table, and include geological factors, morphological factors, physical factors and factors associated with human activity. 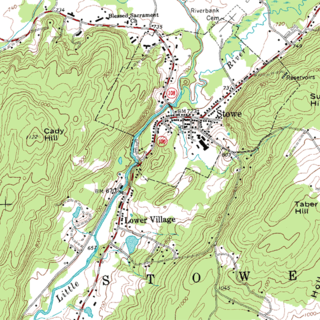 A bedrock river is a river that has little to no alluvium mantling the bedrock over which it flows. However, most bedrock rivers are not pure forms; they are a combination of a bedrock channel and an alluvial channel. The way one can distinguish between bedrock rivers and alluvial rivers is through the extent of sediment cover. River bank failure can be caused when the gravitational forces acting on a bank exceed the forces which hold the sediment together. Failure depends on sediment type, layering, and moisture content. The Truttman Sink is an earthflow within the Humboldt Lagoons State Park, along the coast of Humboldt County, California. It is located between Trinidad to the south and Orick to the north. It deposits materials into the northern end of Big Lagoon and the Pacific Ocean, especially during periods of heavy rain. The soil characteristics, geology, and vegetation along the slope of this mass-wasting feature suggest a combination of an earthflow movement and a rotational slump. Hillslope evolution is the changes in the erosion rates, erosion styles and form of slopes of hills and mountains over time. ↑ Uenzelmann-Neben, G.; Huhn, K. (2009). "Sedimentary deposits on the southern South African continental margin: Slumping versus non-deposition or erosion by oceanic currents?" (PDF). Marine Geology. 266 (1–4): 65–79. doi:10.1016/j.margeo.2009.07.011.